It works as a standalone dessert for a smaller group, or as a centerpiece for a larger dessert table. The clever concept is from Lauryn Cohen, a.k.a the blogger Bella Baker, known for her creative treats. For this recipe, Lauryn makes mini espresso cupcakes, but you can make any flavor and size. The hands of the clock are pretzel rods, swirled with chocolate. If you’re looking for a lighter dessert for Christmas, or want to bake a special gift, try Lauryn’s red, green and white holiday meringues recipe. Lauryn’s Book, Sweet Gifts: 95 Fabulous Holiday Desserts & Crafts, is available at Barnes & Noble bookstores and other retailers nationwide. 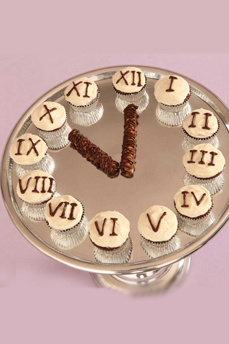 A cupcake countdown to the new year. Photo courtesy Blog.BellaBaker.com. ROOM TEMPERATURE INGREDIENTS. Make sure all of your ingredients are at room temperature before baking. This will ensure a silky smooth, lump-free batter. Room temperature butter and eggs will actually make your cake significantly fluffier than baking with butter and eggs that are still cold. To speed up the process of bringing cold eggs to room temperature, put the whole eggs into a bowl of lukewarm water for about 20 minutes (never use eggs with hairline cracks—they can harbor harmful bacteria). SCOOP THE BATTER. Use an ice cream scoop to divide batter evenly among cupcake liners. Not only is this the best method to accurately measure the batter so your cupcakes bake uniformly, it is also a great way to avoid a huge mess of batter all over your countertop! FREEZE WITH EASE. Unfrosted cupcakes can be frozen in an airtight container for up to three months, so plan ahead and bake cupcakes whenever you have time, then remove from the freezer and completely defrost before topping with the icing of your choice. Find more of our favorite cookie and cupcake recipes in THE NIBBLE’s Cookies, Cakes & Pastries Section.